Hash tags have been around for a while on Twitter but are now starting to come of age on Facebook, Youtube, Pinterest, Googleplus and Google search. Google search is supporting a news feed for hash tags for major subjects and actually classifying posts into major hash tag categories. If you put a major hash tag like #obamacare, #seo or #nfl into Google search expect to see a news feed on the right. Right now if just seems to be for really active subjects, but clearly Google is going after the real time news feed turf of Twitter. A hash tag is merely a identifying label to index Twitter, Facebook posts or Google posts by subject. Now google is starting to assign hashtags to indexed content. 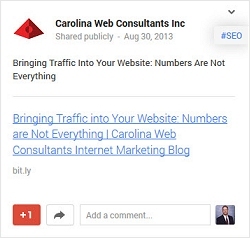 I noticed in Googleplus that you can actually see hash tags that Google is assigning to posts. Note, this is not a hash tag that is in the content of the post, but a hash tag that Google is assigning. You can find it in the top part of the post on your news feed. Not all posts are being assigned hash tags, but just ones that find into major categories. Explore using subject hash tags in Twitter, Facebook and Google posts. Do some research in setting this up. Either the tag needs to be one that is popular or one that you create that will have a seeking audience. Do not overuse. Maximum of 3 in a post may be a good rule of thumb. Do not put them in unless they really apply. Think about developing a hash tag for your brand. This was not necessary before, but with Google now putting hash tags into search, this may e a good strategy. Just use it for company announcements and company related information. Try using hashtags in your web content. I would recommend being accurate on this. Don’t try to fool mother nature (Google). Put in a hash tag that is popular and really relates to your subject. Work you hash tags into the body of a post where it fits into the sentence or put it at the end of the post. For more information on hash tags in Google index go to How do I use Hashtags on Google search?